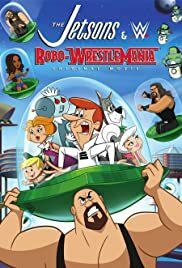 Blast off to adventure in this animated feature where our favorite space-age family, The Jetsons, meet the superstars of WWE. When George unearths WWE's Big Show, who has been frozen for 100 years, the futuristic face-o begins. Once thawed, Big Show wastes no time in taking the WWE belt from the current robot champ as well as taking total control of Orbit City. It's up to The Jetsons to travel back in time and enlist help from WWE's brightest stars: Sheamus, Alicia Fox, Roman Reigns, Seth Rollins and the Uso brothers. Can this cosmic tag-team prevail and set this twisted time-warp straight? Tune in and see with The Jetsons and WWE. The latest installment in Warner Brothers series of animated films featuring the wrestlers of the WWE meeting the classic characters of Hanna-Barbera, previous entries featured the musclebound entertainer/athletes meeting Scooby-Doo (twice!) and The Flintstones. Wrestlers in animation is nothing new, in the 1980s, "Hulk Hogan's Rock N' Wrestling" featured an animated Hulkster and his team of "faces" getting into wacky misadventures and outsmarting the tricks and schemes of the "Rowdy" Roddy Piper and his gang of evil "heels". "The Jetsons" are an interesting choice to do a crossover with. Despite being featured in various commercials, appearing in web cartoons produced by John Kricfalusi, and parodied on shows like "Family Guy" and "Harvey Birdman". They have not been seen in full- length feature since their 1990 theatrical feature "Jetsons: The Movie", which had a less than stellar box-office performance. 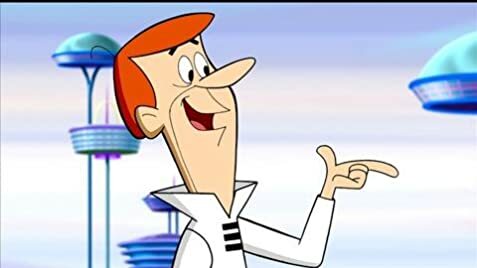 Seeing the Jetsons on a new adventure is kind of refreshing, even if the plot is really ridiculous (hey wasn't the original?). The plot is like this: The Big Show is flying a plane in a snowstorm on his way to his next match with Sheamus, when his plane goes down. Cut to Orbit City, 100 years in the future, Mr. Spaceley puts George Jetson in charge of a drilling project on the now-abandoned surface of the Earth, when he discovers Big Show frozen in ice. George thaws out the giant wrestler and takes him home. Big Show is fascinated by the high-tech future, even the WWE is still around and run by Vince McMoonmahon, but they use robots instead of humans to do the fighting and humans aren't allowed to fight. This upsets Big Show and he goes to check it out. He fights the robots and seizes control of them for himself and proceeds to take over the world. George knows this mess his fault, but thanks to plot convenience, Elroy has invented time travel and Judy is studying the 21st century is history class. The family proceeds to go back to the past (our time) and gets Vince McMahon, Sheamus, and several other wrestlers to help them save the future from Big Show and the robo-wrestlers. The animation is quite good, I liked the character designs of the wrestlers and they fit well with the established. The animation looks very similar to the revived 80s series and the movie (along with many other Hanna-Barbara productions of the period), not to mention it us uses many of those classic H-B sound effects. I also liked Tess McNallie as Rosie and McMahon mentioning "meeting another talking dog" upon meeting Astro. "Robo-Wrestlemania" is not a masterpiece, but it's not the worst thing, either!